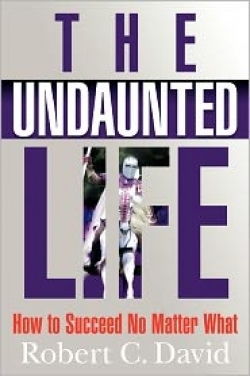 For those who want to rise successfully above life’s obstacles—and who doesn’t?—Robert David’s The Undaunted Life offers a comprehensive road map. With an engaging style, lively analogies, and examples from his own life, David points out the correct choices at any number of life’s crossroads. David provides examples from his own experience to show, first and foremost, how finding success requires having an “undaunted” spirit—remaining “resolute, undismayed, purposeful, and determined to succeed.” But even before readers can heed any of his advice, David says it’s necessary for them to toss out the “excuse pillows” that people often fall back on. There is a disturbing trend in our country. Many people are increasingly looking for answers from the government and institutions. Why? Wouldn’t you agree that the vast majority of resources we need are standing in our own shoes? There’s solid advice on managing money, advancing in a job situation, and how to get a job in the first place alongside advice on relationships, healthful living, food choices, exercise, and “overall happiness.” He includes anything and everything that can be done to improve one’s life, which makes reading David’s guidelines a little like facing a loaded buffet table, wondering where to start, and how much the plate will hold. Take one bite at a time and chew thoroughly; success is guaranteed. In the end, David says, there is an idea “so powerful that I will step out on a limb and tell you that if you only remember one thing about this entire book, it would be this: Whatever you place your focus on will grow, and whatever you ignore will shrink.” In other words, keep an unwavering eye on the goal. David, a master of his own maxims, was successful in the financial services industry before building a business as a consultant, professional speaker, and success coach. Although his guidelines are wide-ranging, they’re nothing self-help aficionados will not have heard, but David’s energetic and enthusiastic presentation, coupled with memorable examples and analogies, will resonate and encourage. It would be hard not to feel motivated to change after reading The Undaunted Life, but as with any self-help book, it’s what happens after you close the book that matters. Motivation must be followed by action, and telling a procrastinator not to procrastinate doesn’t address the underlying issue. Still, David has led the horses to water.